Brittney’s delicate heart prevented her from doing the simplest things like playing with other children, attending school or even walking her dog. At two weeks old, Brittney’s mother, Kris, noticed her daughter’s breathing looked abnormal. Doctors in Trinidad diagnosed Brittney with allergies. She progressively got worse and at 16 months a private doctor diagnosed Brittney with a congenital heart condition known as Tetralogy of Fallot with pulmonary atresia. Tetralogy of Fallot is the most common heart defect in children. Oxygen-poor blood and oxygen-rich blood were being pumped out of her heart into the circulatory system together, which means the blood leaving her heart didn’t have enough oxygen for her body. Pulmonary atresia means that Brittney was born without pulmonary valves, so blood could not flow from the right side of the heart to the lungs. Brittney underwent surgery in Trinidad by a group of travelling cardiovascular surgeons, but needed a second surgery that could only be performed in a proper cardiac institution. While reading a magazine one day, Brittney’s father noticed an article about Herbie Fund. He immediately contacted us. Brittney was evaluated by the Hospital for Sick Children, and accepted to travel to SickKids for surgery. 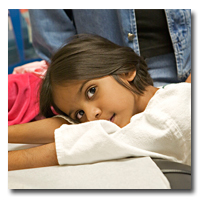 In April 2008, this six-year-old received successful, life-changing heart surgery at SickKids. Kris and Brittney are so grateful to all those who donate to Herbie Fund for giving children access to life-altering care. Charitable Business #10808 4419 RR0001. Copyright © 2019. SickKids Foundation. All rights reserved.